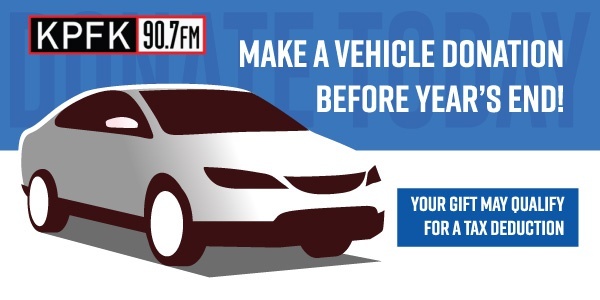 Donate your used vehicle and show your support for KPFK! Our Representative will schedule a pickup that's convenient for you, and provide you with confirmation of your donation. If you donate your car after January 1, 2006, we will mail you a confirmation that states how much money your vehicle sold for at auction. This amount is what you actually claim on the itemized tax return. According to the tax law effective January 1, 2005, if the claimed value of the donated vehicle exceeds $500, the taxpayer is limited to the gross proceeds of the sale. What are the benefits of donating my car to KPFK 90.7FM? KPFK 90.7FM benefits by receiving a cash donation to fund new and existing programs and increase community awareness through local events. In some cases we can take your car, running or not. However, it must have an engine and be tow-able. Contact a representative at 877-KPFK-AUTO or 877-573-5288 to find out if your vehicle qualifies for pick-up. In the rare event that you receive any notification of a lien sale, DMV actions or other activity related to your donated vehicle, please contact us at 877-KPFK-AUTO or 877-573-5288 immediately for assistance. Does the new law affect KPFK 90.7FM? KPFK 90.7FM has additional paperwork in reporting the gross proceeds raised from the sale of the vehicle to the donor and IRS. The process of obtaining the cash donation from the vehicle remains the same.